Special racing throttle with deadman controls, throttle closes when operator removes his hand. Also can be locked open in any position with pushbutton. 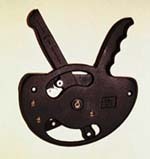 Pushbutton is shielded to help prevent accidential locking. Sturdy all-aluminum non-rust construction, black crinkle finish.